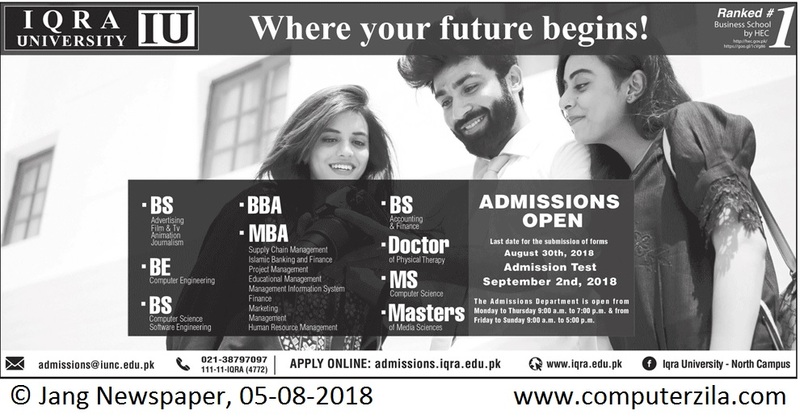 Admissions Open at Iqra University's North Karachi Campus for the batch Fall 2018. IQRA offers admissions in different fields of study for Bachelor and Master Programs. Iqra University is one of the top most Business School in Pakistan. and Ranked # 1 Business School by HEC this year. University DescriptionIqra University (Sindhi: اقرا يونيورسٽي‎) is a private university primarily located in the Defence residential area of Karachi, Sindh, Pakistan. It has additional campuses in other parts of the city as well as in Islamabad. Iqra University was ranked as the top business school in Pakistan by the Higher Education Commission of Pakistan in the rankings announced in 2016. Campus AdressSector 7B/1, North Karachi.